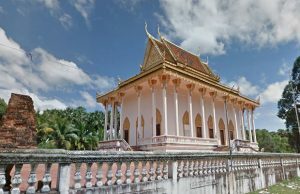 Prasat Andet Temple is located about 27 kilometers northwest of Provincial Town of Kampong Thom, in Prasat Village, Sankor Commune, Kampong Svay District, Kampong Thom Province. Prasat Andet Temple was built in second half of 7th century (627-707) during the reign of king Jayavarman I to dedicate to God Hirihara, in Kampong Preah style and made of brick with masonry, laterite and sandstone. Prasat Andet had isolated plan, built on a 5.30-meter height artificial hill, and was form in rectangular shape with 7.50-meter length, 5.50-meter width and 1-meter thick (interior to exterior). It was facing to the East. 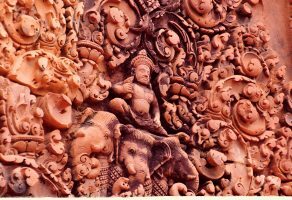 The lintel of Prasat Andet was carved in the garlands and carefully done in the traditional khmer style. The coronet (2.22 lengths) was ornamented around by the rings decorated, and at between of the rings we decorated with garland and bulb flowers surrounded, which are joining each other by the end of the decorations. 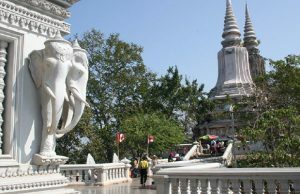 In original former time, this temple contained Harihara Statue standing on a decorative royal throne, and the statue was brought to be kept at Phnom Penh National Museum. The Harihara statue is a body side?s Siva and another body side?s Vinu. The framed door had 1 m width, 2m height and 0.20m thick. On the northern framed door, we saw the marks of a cloven hoof of tiger cat that used to go to the upper box of the door, which remained the marks until now. 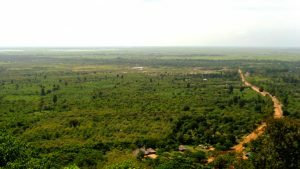 Bird Sanctuary of Boeng Tonle Chmar: Boeng Chmar contains fishing lot 5 and lot 6, and is 30km far from Stoung District town of Kampong Thom Province, there were villages of Nesat, Kamong Kdei, Svay Kor, Mo Doung, Kampong Bradom and Msa Trang Tboung in Peam Bang Commune. The people living in this area with floating houses that are moving up and down according to the water levels in the jungle and flooded forest. The bird sanctuary of Boeng Chmar covers a land area of 400 hectares having an interconnecting network of water channels along the bank of Boeng Kla Lake, rich in flooded forests. This area is connected by two big river tributaries (Stoung and Stung Chik Kreng) flowing down to Boeng Chmar. Beong Chmar is the sanctuary for many kinds of birds.